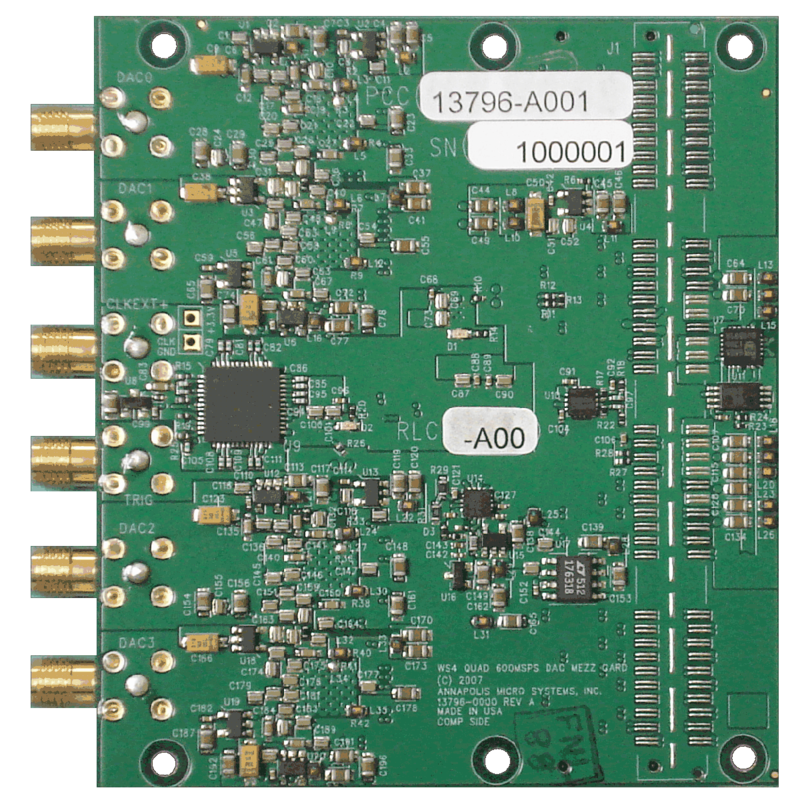 This quad channel 600 MSps DAC supports an multiple internal clock options in addition to an external sample clock and includes a high precision trigger for multi-card synchronization. The WILDSTAR Quad 600 MSps 16-Bit Digital-to-Analog Converter Mezzanine Card allows sample rates as high as 600 MSps. This sample rate is dependent upon the optional internal oscillator or supplied external clock to the Digital-to-Analog Converter. 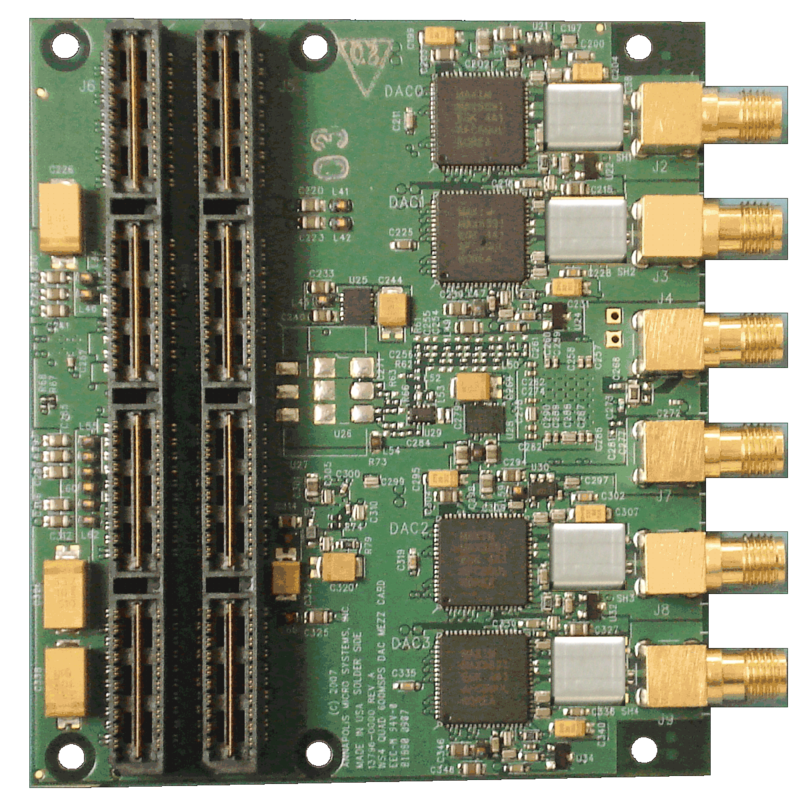 The WILDSTAR Quad 600 MSps 16-Bit Digital-to-Analog Converter Mezzanine Card provides one, two, or four channels of high speed, precision 16-bit digital-to-analog converter outputs to a compatible motherboard. It provides excellent analog performance with flexible high-precision trigger options. External clock can be driven from an AC-coupled signal generator or 1.65V LVPECL clock source, or optionally from an LVDS clock source. Motherboard with mezzanine card(s) installed occupies a single /PCI-X/PCIe or /VPX/VME64x/VXS slot. Full CoreFire™ Board Support package for easy application programming.